Acclimating to life in law school is not easy. It is nothing like undergrad and the difference takes some getting used to. Tomorrow night I am going to be a part of a 2L student panel to give advice to my schools new 1L class during their orientation. One thing I am going to stress to the new students is a school-life balance and how important it is to maintain. 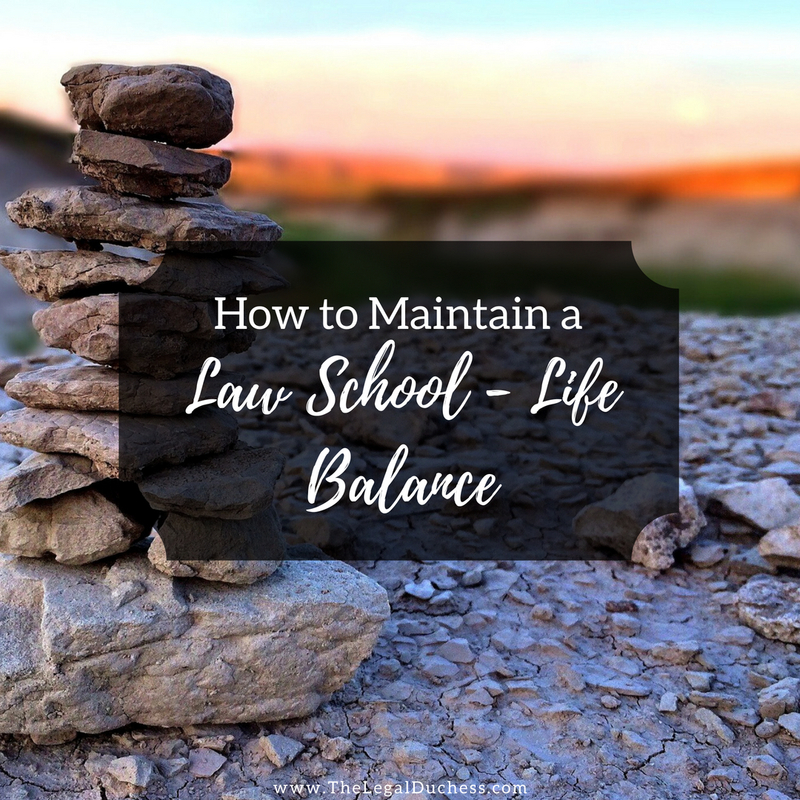 It may not be easy and it will likely take a few weeks to establish a good balance between law school and life but it is very important. I suggest starting right from the beginning with establishing a solid school-life balance. My first few weeks of 1L year were trying... I had a hard time finding a balance between my school work and my normal life. It was about a month into school when my husband sat me down and let me know that I was letting law school take over my life and he was worried. From then on out, I made a point to maintain a better balance between school and life. I wasn't always successful- around final memo time or exams, law school took over. But the rest of the semester, I worked to maintain a good balance between school and life and I think my mental health benefited greatly as did my marriage, family relationships, and friendships. It is easy to get caught up in law school and letting your life revolve around it in the first few weeks/months; if you make a school-life balance a priority from the beginning, it will be easier to maintain in the long run. Here are my tips for establishing a school-life balance right from the start. I am a big proponent of routines. I like things to be set and organized at all times (I am a bit OCD). Having a routine in law school (especially in the beginning) is really helpful for keeping a balance. If you have set times for school and set times for friends, family, and hobbies, it is a lot easier to stick to it. In my 1L year, I had set times for things: Friday nights were pizza and a movie with my husband; Thursday nights were trivia in the local pub with friends; Saturdays were for housework, relaxing and family time; Sunday afternoons were for grocery shopping and getting a jump on Monday reading; Wednesday nights were for face masks and painting my nails once my reading was done. Having this set routine helped me to maintain the balance- I was able to power through my reading and class work Monday-Thursday because I knew that I could look forward to Trivia with friends and movie night with my hubby. I got less burnt out on school work because my weekly workload was broken up with other things I enjoyed. While a routine will help you to have time for things you enjoy, your life scale will still tip down in favor of law school and it will be the biggest part of your life for a few years. Despite that, making a routine that includes time for non-legal activities will help you mentally and emotionally to complete the marathon of law school. One thing I struggled with in the beginning of 1L year was putting down my books. It seemed no matter what I was doing and how hard I was trying to do other things, I would eventually stress out and end up back at my desk either on Thursdays when I got home from trivia or on a Saturday afternoon while my husband was napping. I could not stop stressing about school because it was so overwhelming in the beginning. I quickly became very burnt out and realized I needed to put the books down sometimes and walk away to have a break. I started making Thursdays after 5pm law school book free, Friday after 5om book free and Saturdays I avoided law school things completely. It is very easy to get sucked in those first few weeks and do nothing but law school because you are equally excited to be there and completely overwhelmed and out of your element. Despite the nagging feeling to constantly do law school work, putting down the books and clearing your mind will keep you from getting burnt out and will keep you happier in the long run. It will also make the other people in your life happier: your significant other will appreciate some time with you, your parents will appreciate getting a long phone call sometimes and your non-law school friends will love to go do something fun with you. Law school will mostly take over your life but you have to push back a little bit and not let it take over all of your time. When you are making time for life outside of law school, find some fun things to do! Just watching Netflix or going to the bar in your spare time will get old after a while. I studied at home during my 1L year so when I was taking some "law school free" time- I wanted OUT of my house. I loved going for long walks with our dogs, going for a little Saturday trip to a nearby town, going to the local zoo... anything to get out and about, change up my scenery, and clear my mind of all thing law school for a few hours. It was a little harder in the winter but I loved finding a new coffee shop or even just playing in the snow with my dogs for a while to clear my mind. The more things you can do that will clear your mind for a few hours the better! Law school makes for a tight budget but there are so many free, fun things to do: a walk in the park, free local museums, live music in a local bar, visiting a local shelter to play with shelter dogs, go to free campus events, check out the campus gym and so many more! Make time for FUN because spending hours bent over books is not much fun and if that is all you do, you will go crazy. Everyone had different existing relationships when they enter law school. Some are married or in serious relationships, some are moving away from their parents for the first time and some are juggling being a parent with being a student. Whatever your relationships are, try to make them a priority. It is really easy to put off date night in favor of studying but that will hurt your marriage or relationship in the long run. If is easy to forget to text your friends when law school is so overwhelming but they won't understand that and may be hurt but your distance. Your parents will love nothing more than a weekly phone call to hear how you are doing and to tell you they are proud of you for working so hard. It may take some juggling to keep relationships as a priority and still succeed in law school but it is possible. You do need to let those in your life know that you are going to be busier than ever before and won't have as much time for them but cutting them out completely is not the answer. Friends and family are so necessary as a support system during the trials of law school so making sure that those relationships remain a priority is important. In order to do all of this- succeed in law school and have a life outside of it- you need to become a master of time management. My suggestions for this is a planner, a well-maintained calendar on your phone and a defined routine. My planner keeps my life in order- I have daily to-do lists, countdowns, activities and it seriously keeps me sane. My planner helps to keep my schoolwork manageable- I can write in there a schedule for finishing that massive reading assignment by spreading the pages over a few days and checking it off in my planner as I complete it. It also helps me to know when I am going to have busy weeks or weekends and if I need to do a little extra ahead of time to keep from getting overwhelmed. My phone calendar keeps me from missing appointments and so I never overbook myself. When a friend randomly asks if I can do something next Sunday and I don't have my planner with me, I can consult my phone calendar to say yes I have time or no I have way too much reading due on Monday. It is so simple to always have my calendar with me to avoid saying I can do something and later, after looking at my planner, finding out it was not a smart plan or a good time for that and having to cancel or overwhelm myself by doing too much. Lastly, my well-defined routine keeps me in check. Having defined times for things keeps me on top of everything: I don't stress about my house being clean because I do it on Saturday mornings; I don't worry about getting my reading done because I know that is what I will be doing Sunday-Thursday evenings. My routine keeps my time well managed and keeps me sane. Start your 1L year off right and make a school-life balance a priority from the beginning. You will be thankful for it as the school year goes on!